1.4.1 Is the best light spectrum for cannabis 8 or 12 bands? 1.6 Energy Efficiency – Which one helps in saving in the long run? 1.9 Price – Which One is Made to Break Bank? Comparing the G8LED and Platinum LED grow lights is akin to comparing a Ferrari and Lamborghini. That said, even the prospective owner of a new sports car wants to know what they’re getting for their cash. That’s the reason we decided to compare these two top shelf grow lights in a head to head comparison. 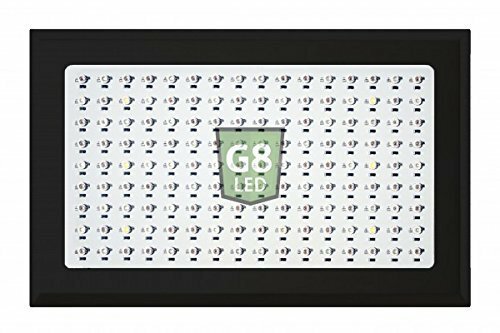 Feel free to scroll through the easy to read the G8LED to Platinum LED comparison tables we’ve created below. If you’re the type who wants to get straight to brass tax, these tables are for you. We’ve compared the 900 watt models down to the 300 watt models. If you like reading more detail about these grow lights, keep scrolling. 4' X 6' @ 18"
6' X 4' @ 18"
17.5" X 14" X 3"
36" X 9" X 3"
4' X 5' @ 18"
6' X 3.75' @ 18"
17.5" X 11" X 3"
3' X 4' @ 18"
4.5' X 4' @ 18"
15.8" X 8.8" X 3"
19" X 8.5" X 3"
3' X 2' @ 18"
Before diving deep into the ocean of technical specifications and working elements in the G8LED and Platinum LED grow lights, we’ll briefly introduce the brands. On occasion when you purchase a top shelf product, you actually do get additional benefit over the low end products. With G8LED and Advanced Platinum, this is the case. It’s been more than 8 years for both the brands since they started developing and delivering quality LED grow lights to their customers. 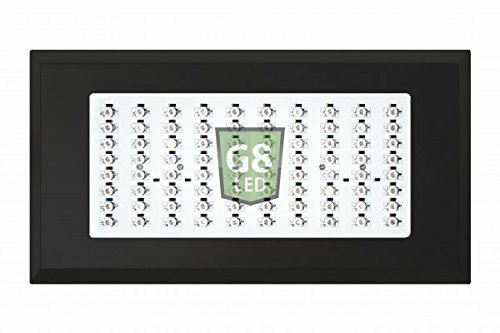 G8LED has been featured in various communities and magazines related to indoor growing and cannabis cultivation like HighTimes Magazine, Wiki Top Ten, etc. Platinum LED is a widely known brand for their Record Breaking PAR tests and public test results. Both brands are based in California, and both products are manufactured in the United States. You’ll be dealing with highly reputable and customer satisfaction oriented brands for these grow lights. Overall the reviews on Amazon are positive, but Advanced Platinum seems to be experiencing some quality control issues from verified purchasers on the P450 model. The rest of the Advanced Platinum models seem to have great reviews throughout a large sample size of reviewers. 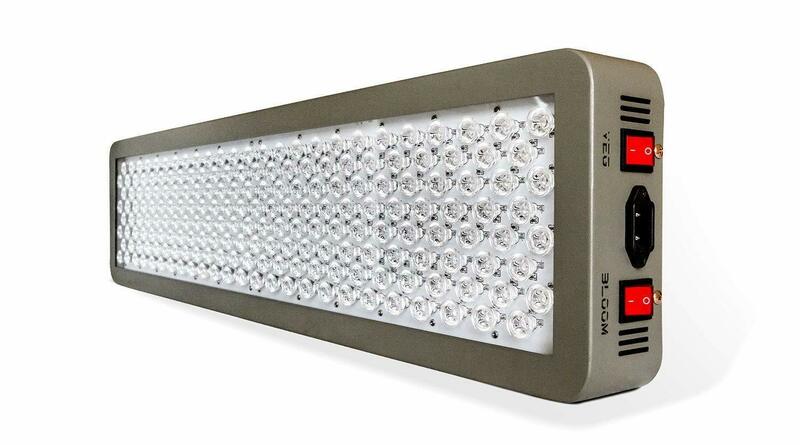 G8LED has fantastic reviews for each model, and a large sample size of reviewers. I would certainly feel comfortable purchasing a G8LED. Now, let’s talk about several technical features for our G8LED VS Platinum LED review. The build quality is strong with both of these lights. They’re manufactured in the US, and each brand has refined the lights considerably over time. G8LED is ETL Certified meaning the build conforms to North American safety standards. When you’re dealing with grow lights that can potentially get hot in an indoor setting, you definitely want to know you’re working with a safe product. The most vital element of any light is a spectrum. You can say the prime motive behind utilizing the LEDs in indoor growing is to mimic real sunlight to a maximum possible extent. However, for comparing spectrum, we choose G8LED Mega 600W and Advanced Platinum P600. In our observation what we concluded is G8LED Mega 600W delivers the most optimal spectrum of 8 bands and also includes IR and UV in its spectrum. Upon researching the reason behind excluding several bands from the effect as a full spectrum is expected to be of 12 bands, we got to know that G8LED Mega 600W and all other variants from G8LED are designed similarly. All models by G8led deliver an 8 band spectrum and manufacturer claims that inclusion of additional bands in the range increases under utilization of the panel. However, in Advanced Platinum P600 we noticed a complete full spectrum of 12 bands including IR and UV. Is the best light spectrum for cannabis 8 or 12 bands? The optimal spectrum mix ultimately depends on your desired outcome. Do you prefer to grow for flower weight, flower density, or flower potency? Based on that answer you need to adjust your red:blue light ratio. No grow lights on the market allow you to adjust your red:blue light ratio beyond switching between vegetation and bloom mode. Even that capability is argued away by many reputable brands. So each brand manufactures to their own idea of the best red:blue light ratio but the “optimal” ratio if there is one, is highly debatable and not settled science. The fact that G8LED went out on a limb and only provided 8 bands in a market where every other light has 12 bands tells me they needed a damn good reason to do so, at risk of appearing like an inferior product. I would trust their research on this, although if you don’t want to rely on an 8 band spectrum then you can choose Platinum LED P600 for a full 12 band spectrum. One downside is G8LED’s grow lights require a bloom booster in the majority of cases due to lack of red factor in their lights while Platinum LEDs don’t need any additional supplementary lights to fulfill spectral requirements of the plants. All said, after reviewing G8LED vs Platinum LED Spectrum, we conclude Platinum LED to be a winner on this front. We’ve also reviewed some top notch COB grow lights which features some modern technologies to improve intensity and penetration rates. 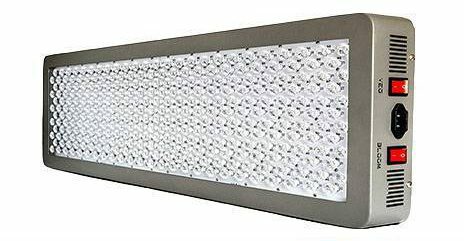 We often recommend our readers to neglect HPS replacement while deciding on an LED grow light. Instead you should consider PAR or PPFD results as a prime factor. As far as this comparison is concerned, G8LED Mega 900W stands at 1540 uMol from the height of 18” on other hands; Platinum LED Series P900 stands high with massive 1615 uMol from the height of 18”. Advanced Platinum proves that they are experts as far as PAR and intensity of any light from their product line are concerned. You might like to check out this PAR test for Advanced Platinum. Watch the video. It’s clear that Platinum LEDs is on winning line right now. As in the case of PAR capabilities the Advanced Platinum product line wins the streak. Energy Efficiency – Which one helps in saving in the long run? We have observed the majority of people neglecting this factor while purchasing an LED grow light for their indoor cannabis grow space. But this is one of the crucial elements to consider in the checklist as it helps in saving a lot on your electric bill in the longer run. For energy consumption comparison we used G8LED 450 Watt vs Advanced Platinum LED P450. What we observed in our comparison is G8LED variant pulls around 270W at max for its perfect operation. The Advanced Platinum variant pulls around 255W from the wall. However, if we compare G8LED Mega 900 with Platinum P900 then results are reverted and G8LED seems to be a winner. Yeah, G8LED Mega 900 pulls around 540W while P900 from Platinum LED pulls around 557W from the wall. So, results vary based on the model of each brand. A 10% difference may not be that big of a deal to you if you’re only using a couple lights. We wanted to check the best results for coverage and hence considered two panels from each manufacturer for comparison. From G8LED it’s the 240W and 450W models, while from Advanced Platinum LED it’s Series P300 and Series P450. In our test and survey as well, what we conclude is something like G8LED 240W could cover around 3’ X 2’ of the area from the height of 12-16” while Advanced Platinum P300 could cover around 4.5’ X 3.8’ from the height of 18”. On the other hand, G8LED 450W could cover around 3’ X 4’ from the height of 14-16” while Platinum LED P450 could cover around 4.5 X 4’ from the height of 18”. 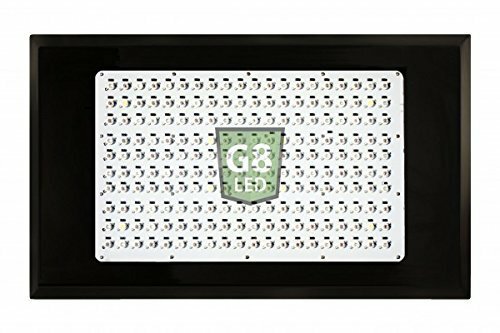 G8LED recommends a height of 12-16” only to improve penetration rates of your plants. In case you want to compromise on it and want to expand your grow space, it’s possible by increasing the height. Yeah, this way both brands could get the similar area of coverage. We always say coverage is more of an art than a science. 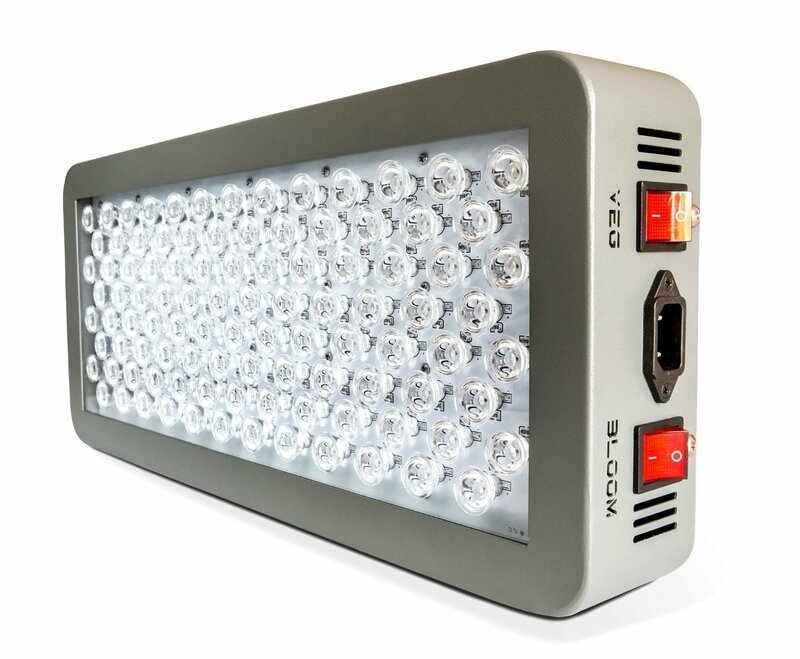 Also, watch this video to get a quick overview about G8LED Mega 450W. In this coverage review we’d conclude it’s a tie for both brands. Both are easily cover a massive area compared to other grow lights available on the market in the same Watt segments. For cooling, both brands utilized top-notch equipment in their products. Both brands feature advanced heat sinks along with top rated cooling fans. We’re looked into comments on the cooling abilities of both brands, and reviewers have said noted quiet fans with no heat issues. One reviewer noted their G8LED was cool to the touch following 24 hours of operation. Impressive. A well balanced environment in a moderate grow tent could bring tremendous results. As far as cooling, both brands seem to excel. Price – Which One is Made to Break Bank? We often recommend our user’s to consider power efficiency instead of price. However, while deciding one out of two premium products, it’s also necessary to focus on price as well. However, you can check the prices of all the variants, and you’ll notice the difference. According to our research, prices of G8LEDs are higher than platinum LEDs. Also, we used G8LED Mega 900W with Platinum LED Series P900 and Platinum LED P600 Watt with G8LED Mega 600 for comparing the prices. 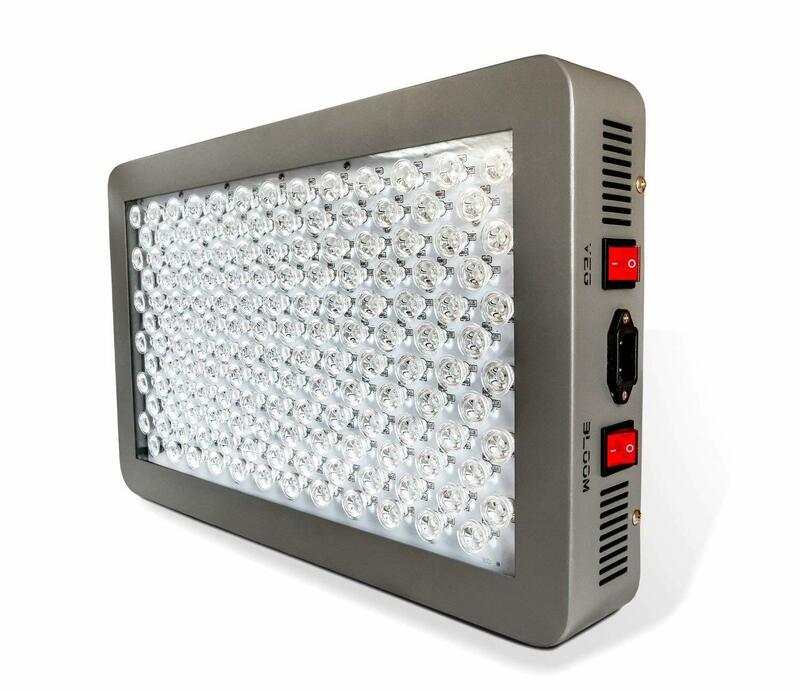 In case, you don’t want to invest in a high profile light and prefer one of the Best Cheap LED Grow Light that work, then we’ve reviewed those lights on our site as well. Buying a product isn’t the end of the game. You should look at the level of satisfaction a brand offer to their customers as well. Well, in this case, Advanced Platinum LEDs offers 30 days money back policy along with 5 years manufacturer’s warranty and will deal with all the issues. However one very important caveat that perhaps Advanced Platinum doesn’t explicitly advertise is that you must keep your box to be eligible for warranty claims. That’s according to one verified purchase review. G8LED has different warranty policies for different products. The warranty duration varies between 2-5 years depending on the product. If the level of customer satisfaction is concerned, then both brands are known for their quick response system and customer query resolutions and solve your issue within no time. As we’ve mentioned each critical aspect of each brand. Now, it should be clear to you which one is made for you. However, upon researching yield results what we discovered was a bit shocking. Yields during harvest time were better in G8LED compared to Advanced Platinum LEDs. It’s tough to decide the reason behind this, but perhaps the 8 band spectrum works better after all. Also, none of the G8LED variant features any mode controlling mechanism like veg bloom dimmer or switche while Platinum LED offers veg bloom switches in all their variants. So, yeah even if Platinum LED is on winning side in almost all the aspects G8LED has proven an impressive product as well.